Everyone who likes active leisure in nature will like trips with canoes or catamarans. This is the best way to take a break from work stress, the city’s emergency and noise. Also the swim trip with catamarans or canoes will be liked by those, who want to go in couples or with whole family. Children from three years old feels perfectly in this kind of journey. Sailing tourist canoe or catamaran is straightforward, no advance preparation is required. Increasingly, heads of institutions provide entertainment for their employees – a tour with canoes or catamarans. We ensure that water trips will fascinate people of all ages. 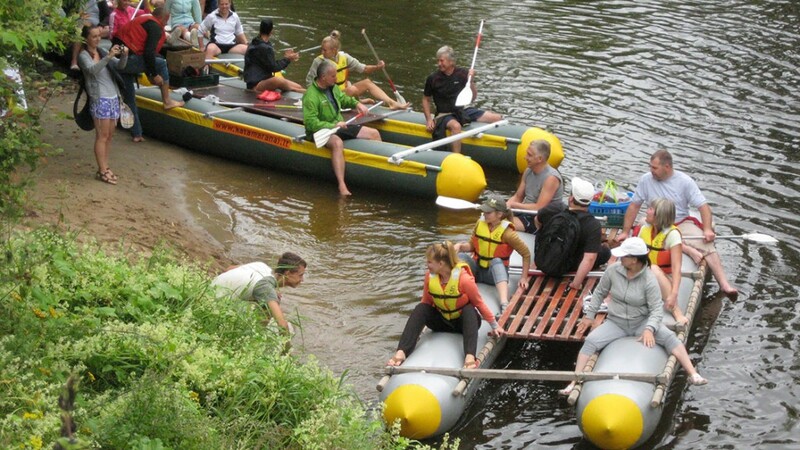 Since 2003, we have inflatable canoes and catamarans, with this equipment we are having picnics in Kelme region, swiming in Dubysa river and Tytuvenai regional park lakes. In our water turism collection we have eight catamarans, which are completely safe to swim in a stormy rivers. They will never tip over in the fast-flowing river loops, and you will not have to pull out your dropped bags or food from the water. You will only have to watch out for the rain or hot summer sun. Our catamarans can hold between four to ten people. Also we can offer you a canoe route. We have lots of different routes to choose from. Every tourist is dressed with a life jackets, so that the trip could be fun and carefree. You just have to choose the most appropriate day and the route for you, and have a good-humored and fun trip. All you have to do is just call us, take all the necessary equipment, right attitude and >unforgettable weekend or a whole week of holiday is guaranteed!